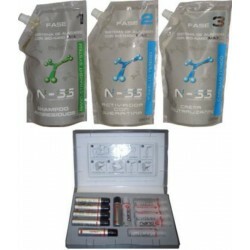 Nanokeratin - Just Beauty Products, Inc.
Nanokeratin There are 31 products. TCQ Nano Technology Nebulizer Machine Kit will break down the molecule of the product into 1 billionth of the original molecule. From the brush, that is attached to the machine by a hose, you will get a fine cold mist, which is the nano product. Tiny particles of product penetrating the hair very deeply, leaving it shiny, silky and soft. TCQ Nano Technology Nebulizer Kit Includes:1 Nanokeratin Nebulizer machine 2 Nanokeratin applicator brush 2 Extensor Hoses 2 cups1 Box with 12 Vials Treatment to choose1 Deep Cleansing Shampoo 1000 ml. 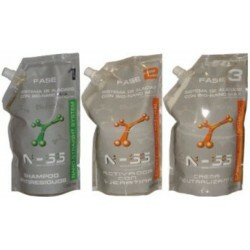 Nano Technology has a treatment that will help to moisturize and hydrate dry hair by nanomolecules of nano hydration. 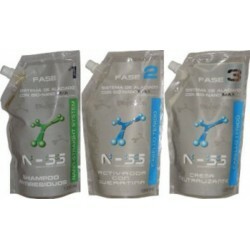 It is Nanokeratin NANO HIDRATE a treatment for very damaged and breaking hair. TCQ Cortex Plus Nano Technology is recommended for dyed hairs and with extreme breakage - Increases hair strength by providing elasticity. The nanokeratinization it's a process that introduces keratin nanomolecules into fissures in the hair threads, caused by chemical process such as (relaxing, dyeing, straightening) and environment. TCQ Nano Hydra Keratin Phase 1 Deep Clean Shampoo cleans hair follicles and scalp removing product build-up, oil and dirt. Ideal to use before hair treatments. TCQ Nano Hdra Keratin Phase 2 Folrmaldehyde Free is a revolutionary hair reconstructor and volume reducer treatment that eliminates frizzy hair, leaving it straight or wavy, healthy and shinning for up to 8 weeks. 100% ORGANIC NON-TOXIC Keratin formula that rids your hair of frizz, adds shine and repairs your strands. TCQ DR Deep Repair Extreme Liss is a cream conditioner to control frizz and hair volume. Ideal for home use to reinforce the TCQ NANO HYDRA KERATIN TREATMENT. TCQ Nano Hydra Keratin Treatment Pack 100% Organic Formaldehyde Free is a revolutionary hair reconstructor and volume reducer treatment that eliminates frizzy hair, leaving it straight or wavy, healthy and shinning for up to 8 weeks. 100% ORGANIC NON-TOXIC Keratin formula that rids your hair of frizz, adds shine and repairs your strands. TCQ Nano Arganoil Moisturizing Repair Shampoo is a Moisturizing Shampoo for all hair types. Excellent for dry and damaged by chemicals. The Nano Argan Oil REPAIR MOISTURIZING SHAMPOO gently cleanses hair while replenishes moisture and protects against environmental damage. TCQ Nano Arganoil Nourishing Leave In Cream For All Hair Types is a Conditioner oil Leave-In with nutrients that help to the most rebellious hair, adding moisture, softness, shine and UV protection. 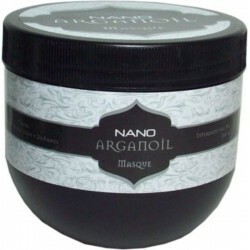 TCQ Nano Arganoil Deep Repair Masque is a reconstructor that revitalizes dry, damaged hair. A combination of argan oil with the oil of tea tree oil, chamomile, aloe and algae extra ct. Rejuvenates and rebuilds the hair, leaving nutrients, improving elasticity and body hair. TCQ Nano Arganoil Healing Oil Spray Light is a ultra fine mist that instantly absorbs into hair, weightlessly infusing moisture, health, softness, protection, control and shine. This oil is ideal treatment for all hair types and is mainly beneficial for dry and damaged hair. 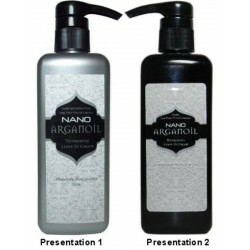 TCQ Nano Arganoil Therapeutic For all hair types is a treatment instantly absorbed into the hair, weightlessly infusing moisture, health, softness, protection, control and shine. TCQ Nano Arganoil High Repair Pack (Meadowfoam - Argan - Ceramidas) Strengthens, nourishes, revitalizes the hair and improve your health. Confers brilliance and manageability to hair extravagantly. High absorption and deep penetration into the hair follicle and scalp. Its non-greasy lightweight nature is absorbed instantly and forms a protective barrier. 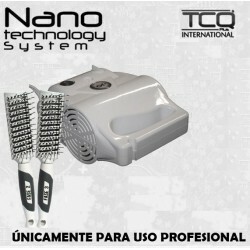 TCQ Nano Technology Lotion Phase 2 Recommended for home maintenance after application of Nanokeratin treatment after a permanent straightening. TCQ Nanokeratin Shampoo Phase-1 Recommended for home maintenance after application of Nanokeratin treatment after a permanent straightening. Shampoo without salt for hair care and strengthening. TCQ Nano Thermal Lotion It's a protective moisturizer spray, it can be used in ironing, with hairdryer and tons, it was made with keratin and provides smoothness and brightness. 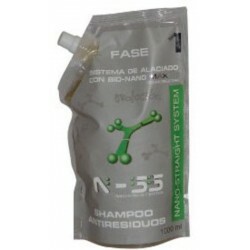 TCQ NANOCELL Hair Loss Shampoo (Phase 1) (UNISEX) Nanocell is based on stem cells Argan tree. It is a unisex product for people who have hair loss. This acts by stimulating capillary stem cells that activate the rejuvenation of the dermis of the scalp and regenerate new hair, strengthening existing hair. TCQ NANOCELL Hair Loss Tonic Phase 2 (UNISEX) Nanocell is based on stem cells Argan tree. It is a unisex product for people who have hair loss. This acts by stimulating capillary stem cells that activate the rejuvenation of the dermis of the scalp and regenerate new hair, strengthening existing hair. 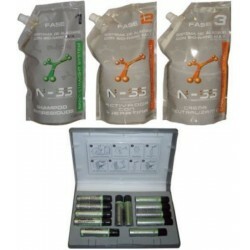 TCQ NANOCELL Hair Loss Kit Nanocell is based on stem cells Argan tree. It is a unisex product for people who have hair loss. This acts by stimulating capillary stem cells that activate the rejuvenation of the dermis of the scalp and regenerate new hair, strengthening existing hair. Nano-Straight System Phase 1 Deep Clean Shampoo: Hair follicles and scalp removing product build-up, oil and dirt. Ideal to use before hair treatments. TCQ Smoothing Treatment Nano Arganoil Volume Reducer Control Frizz kit (4 items): Total control for 8 weeks. 100% volume removal from the hair. Straightening up to 90% on natural hair. Unlike our NSS straightening, you can wash your hair an hour after applied. TCQ Relaxer NSS Kit for 100% Natural Hair 1000 ml plus Photon Care 12 Phials is a proven system to give more time to pose compared to traditional straightening. This allows the stylist, make an excellent service without harming the skin or hair during the permanent straightening process. TCQ Relaxer NSS Kit for Dyed Hair 1000 ml plus Nano Hydrate Treatment 12 Phials is a proven system to give more time to pose compared to traditional straightening. This allows the stylist, make an excellent service without harming the skin or hair during the permanent straightening process. 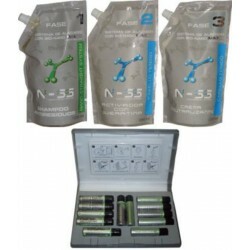 TCQ Relaxer NSS Kit for Dyed Hair 1000 ml plus Cortex Nanokeratinization 12 Phials is a proven system to give more time to pose compared to traditional straightening. This allows the stylist, make an excellent service without harming the skin or hair during the permanent straightening process. NSS Kit for Natural Hair 1000ml plus Nano Hydrate Treatment 12 Phials is a proven system to give more time to pose compared to traditional straightening. This allows the stylist, make an excellent service without harming the skin or hair during the permanent straightening process.